Dominick Birdsey is a man carrying a heavy burden. His twin brother, Thomas, is schizophrenic. As the brothers get older, Dominick finds himself increasingly carrying the weight of caring for Thomas to the detriment of his own life and relationships. When Thomas commits a horrible act of violence while claiming to listen to the voice of God, Dominick is forced to re-evaluate everything he thought about his decisions, his family, and putting himself last. This is my last fictional foray into the works of Mr. Lamb (until he writes another novel, hint hint!). I enjoyed She's Come Undone and I thought The Hour I First Believed was amazing. There are a lot of similarities between this book and The Hour I First Believed. Both feature a male protagonist who looks at his life with a new perspective after a major tragedy. In each book, the main character discovers letters or a book that will impact the way they continue with the rest of their lives. Dominick is given a manuscript of his grandfather's autobiography. He originally plans to get it translated into English as a present for his mother, but he loses the book. When he gets it back in a bizarre turn of events, he decides to read it and try to understand the man who impacted his mother so much. It is a testament to Lamb's skill as an author that I was just as interested in the autobiography of Dominick's grandfather as I was in Dominick's experiences. Domenico is not a likable character. He is full of himself and cruel to the people in his life. As Dominick learns about his heritage and his family, he is at first horrified at his grandfather's actions. But he soon discovers that the story of his grandfather informs his in ways that he could not have imagined. 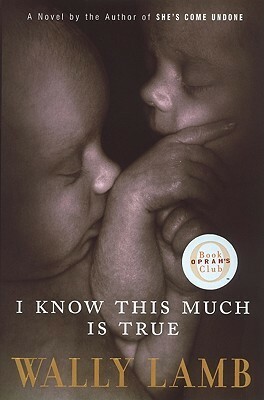 I Know This Much is True is a powerful look at the other person - the one who is on the sidelines, the one who is the caregiver, the one who looks after the person who can't care for themselves. It's a difficult place to be as you care for someone you love with the knowledge that the care you give is a tremendous drain, financially, physically, and emotionally. Dominick is someone who has a lot of anger that his brother is sick, that the system is failing him, and that their mother could never stand up for them to their abusive stepfather. When Dominick tries to find some happiness of his own, his new family falls apart after the loss of their baby. This is a sweeping novel about the ways in which we deal with grief and the disappointments of our family. Dominick ultimately realizes that while he has been shaped by his family, he cannot be controlled by it. He must choose his own destiny and decide which relationships can be salvaged and which ones are destroying his life. This is a gigantic novel and it's not an uplifting one, but it is not a tale of hopelessness. If you find yourself wondering if you could cart a 900 page book around with you so you don't miss a single minute of reading, don't say I didn't warn you. Me too. I think his only fiction I have left is his Christmas novella. I'm going to save it for next December...if I can remember to get it then!